A piece of news that is not so surprising knowing the mastery of Japanese chefs when it comes to preparing and cooking fish. 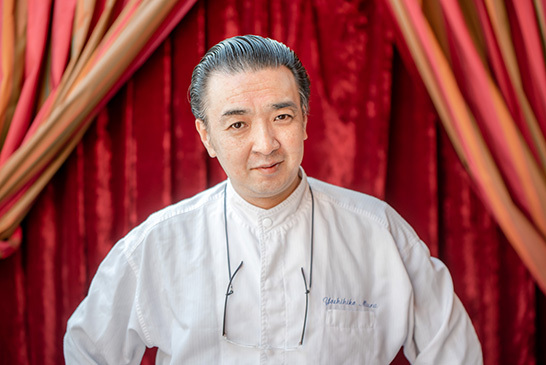 Yoshihiko Miura thus puts his expertise to the benefit of Le Dôme, the Parisian reference for sea food. The highlights of the House such as the meunière-style sole and bouillabaisse remain of course, but the menu evolves with several new dishes, such thick skate à la nage in ginger broth et aux herbes, fillets of red mullet with sorrel and green zebra tomato confit as well as the the mackerel “brûlé” with pineapple carpaccio. A touch of Asian flavour to a French classic. By the way, Yoshihiko Miura started out learning the traditional French cuisine in Tokyo. As the spiritual heir of Auguste Escoffier and Joël Robuchon, he excels at creating recipes that appear simple, but in fact require high precision and technical skills. Magnifying the French local produce through the lens of his country of origin (cutting, ingredients— herbs, spices, seeds, etc.) he received his first star after only 4 years in France. At Le Dôme, where the quality of the produce is always a primary concern (the House sources directly from fishermen in Brittany), he can express his talent to the full. Since good news usually come in pairs, Le Dôme, has created a lunch formula at €43 (entry and main course or main course and dessert) allowing all gastronomes to come and taste this Japanese style seafood kitchen. Open daily from 12 noon to 3 p.m. and from 7 p.m. to 11 p.m.